India has suffered from centuries of caste-based discrimination and oppression. Generation after generation of certain sections of the society have been looked down and trampled upon by the system, and only in the recent few decades after independence is this section beginning to see any glimmer of hope. Social inequality is a truth in the India demographic, and most of the socially backward have cascaded to economic backwardness due to historical discrimination. As a civilised democracy, it is our sovereign duty to extend our support to our fellow brothers and sisters. Caste-based reservation helps in this by addressing the issue at its bud - inequality of opportunity. Caste based reservation is a form of affirmative action. Though it was introduced as a temporary measure in the constitution to uplift those discriminated against, it has been continued and expanded till date. But this was necessitated because of little change in the status quo in terms of social equality, especially in rural India. Any effort to repeal caste-based reservation would be to throw the baby out with the bathwater. Though there have been aberrations and various sections have held the country to ransom demanding reservation, the positive benefits cannot be ignored. Allowing upward mobility for the socially left behind by means of better opportunity allows them to build better futures for their children and community. It creates a support system that creates a virtuous cycle for the socially backward allowing them to climb the ladder of equality as a society. The real question to be asked is why even so many decades after their coming into force, the improvements in social equality are marginal. Why have the various policies implemented by the government been ineffective on a national scale? The rural-urban divide when it comes to the efficacy of these measures are also to be studied. Once these can be answered and addressed, much more comprehensive and efficient policies could be implemented. Caste based reservation is a typical example of the Cobra effect. Rather than solving the social inequities, caste-based reservations accentuate them by creating resentment within the population and deepens divisions. When people of comparable skills and means compete, giving one preference over the other on basis of the lottery of birth is grossly unjust. That this has been going on for decades, denying India the chance to become a meritocracy, is a sad reality. Politicians of all hues and colours have, has and will milk this issue by treating it as a vote bank tool. The logic is simple, if perverse. Give a homogenous population an unfair advantage over the rest and win their loyalty and thereby votes. Happening as it is in India, one of the world's most heterogeneous countries, caste based reservation is a slippery slope down which we may already have gone too far. The fact that around 70% of the population fall under the category of 'minority' is the messy and illogical situation we have gotten ourselves to. 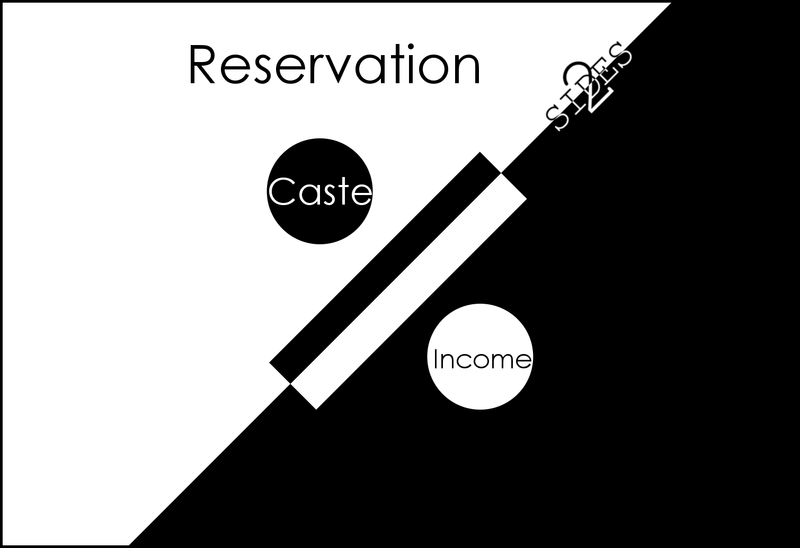 An income-based reservation scheme would counter the ill effects of caste-based reservation to a large extent. With the advent of Aadhar and GST, income based reservation schemes, such as the reservation for Economically Weaker Sections (EWS) of 'forward' communities, are increasingly feasible. Income-based reservation targets those with equal skill, but denied equal means, by attempting to equalise the availability of opportunities for these two. It would directly benefit those of 'lower' castes and genuinely in the minority who are economically weak without denying the same to a person from comparable circumstances but belonging to 'higher' castes and in the so-called 'general' category. It would also be difficult to exploit income based reservation schemes for votes as the beneficiaries will be a heterogeneous group with varying interests. And unlike caste-based reservations which will remain hereditary by their very definition, an income-based scheme will benefit individuals on a case to case basis, irrespective of their birth. That would be true equality.